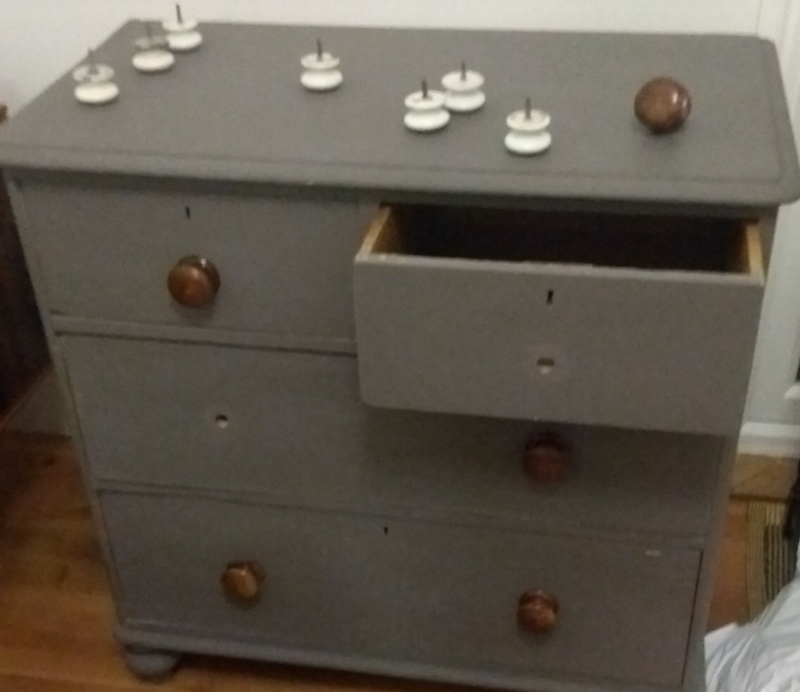 Trying to replace the handles on a chest of drawers and the 'new' handles are a touch to short for the thickness of the wood to get a normal nut on the end. Is there a Tee nut type thing that can solve my issue? Any suggestions (UK) where I might get one? Any other ideas? 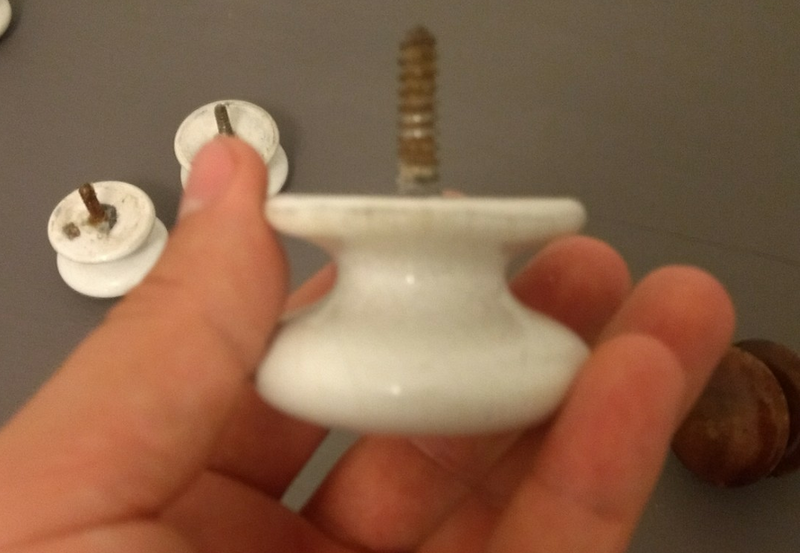 However, your new knobs are actually wood screws. Note the coarse thread and threads being brought down to a tip. These are made to screw straight into wood, into a pre-drilled hole drilled somewhat smaller than the screw size. Screwing the knob in pushes aside and compresses the wood fibers, while the teeth provide force engagement for the pushing and pulling to follow. ...The answer is light woodworking. You will need to drill the old holes larger, up to precisely an available wood dowel size. 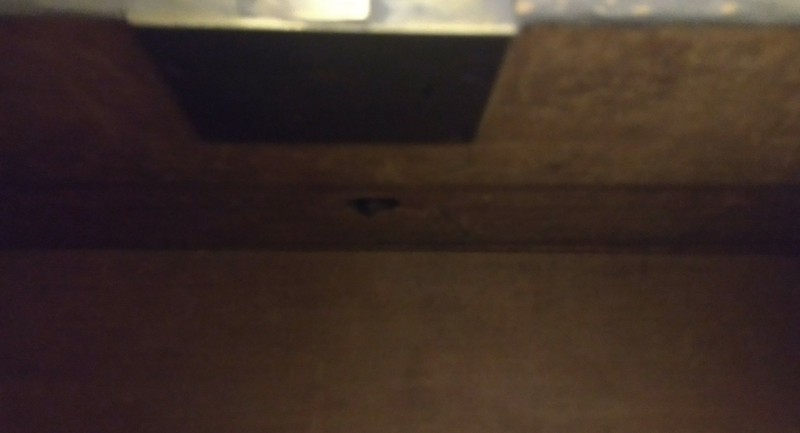 Use the smallest size hole that will work, and "work" means you've overdrilled the old hole enough that 90% of the hole surface is freshly cut wood and not the dregs of the old hole. Glue won't stick to that very well. I use epoxy in West System, I'll show you how to do it without, but bear with me. I'd mix the smallest possible batch of "slow" epoxy, and add "404" high-density adhesive filler to it's like peanut butter (non-slumping non-oozing). I'd swab the hole with it, swab the dowel with it, and then tap in a pre-cut length of dowel gently with a hammer to flush. Immediately wipe off the ooze and excess, make another visit in 2 hours to remove any other excess while it's soft. That ain't coming outta there. Without West: The hardware store has a row of dual-syringe epoxy packs, ranging from 5-minute epoxy to 8-hour epoxy. Work time is your friend, real West is a 4-16 hour epoxy. Any West dealer (marine supply) will stock Actual 404 filler, but not necessarily in the affordable small packs (so call ahead to avoid "404 Not Found", sorry, had to say it LOL). Or make a "good enough" substitute for 404 by making sawdust any way you please, and using window screen or a similarly fine kitchen collander (wood isn't toxic) to get only the fine stuff. Give the epoxy a day to cure. It helps to leave the near empty mixing cup out; poke at the stuff in the mixing cup, if you can still put a ding in it with your fingernail, it's too soft still. Hard epoxy is HARD. If you just did it with Gorilla Glue or whatever, OK, we are here. Surface restored. Now find the right drill size. You want the hole to be just large enough so screwing in the knob is possible, but not so loose that it goes in easily and starts flexing and working as you use it, enlarging the hole as it goes. It appears that's what happened to the last guy, which is why you're here. This is trial and error; start small and work up in drill size carefully. The screw thread shown for the new handles has a pointed end, so they're wood screws, used without nuts. To use the wood screw fastener, reduce the size of the hole in the drawer. This can be done using wood shims, such as pieces clipped from a bamboo skewer, or the hole can be filled with "plastic wood" or epoxy cement. If using cement filler, you may need to drill a small pilot hole to start the screw. That said, wood screws are not quite as sturdy as bolt and nut, so the handles may eventually loosen. In that case, just add more filler. Not the answer you're looking for? Browse other questions tagged woodworking screws wooden-furniture or ask your own question. How to build a removable bench for a sit-in window?